Who is the Boston Celtics' third-best player? 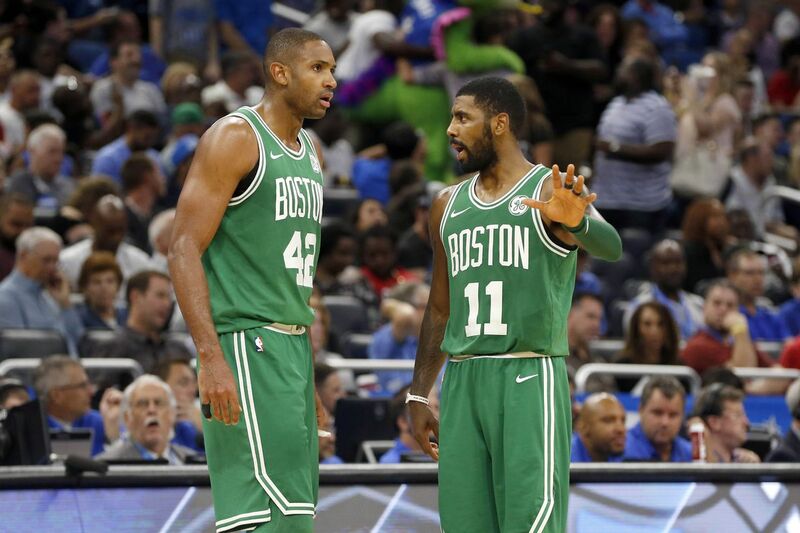 Entering this season, the question surrounding the Boston Celtics after an offseason full of roster overhaul was: how will this new big three fit together? Of course, the narrative changed drastically when Gordon Hayward went down with a serious foot injury. Twenty-nine games later, the Celtics sit atop the Eastern Conference. There are many reasons for the Celtics’ early-season success, but such a hot start has me thinking: with Hayward out, who is the Celtics’ third-best player after Al Horford and Kyrie Irving? Let’s first narrow down the options. The Boston role players have been a huge part of the team’s success this season - that cannot be stated enough. But for the purposes of identifying the third best player on the team, we will limit our options to only the guys playing at least thirty minutes per game, as these are the players who have the largest impact on team success. This leaves us with: Jayson Tatum, Jaylen Brown, and Marcus Smart. Let’s look at each of these three individually. The Celtics faithful are well aware of how Smart impacts this team. Watching Marcus play is like watching the game with an IV of black coffee hooked up to your arm. It sounds cliche at this point, but Smart just consistently makes winning basketball plays. Though Marcus does not usually start games, he is frequently on the court to close games and is a part of Boston’s second most used lineup this season. Defense is his calling card, as we all know, and Smart has not disappointed on the defensive end this season. Per Basketball Reference, opponents have an offensive rating of 103 against Boston with Marcus off the court and an offensive rating of only 97.3 with Smart on the court. For the purposes of selecting this team’s third best player, however, Smart’s offensive percentages have to disqualify him. Despite some chatter about Smart improving his shot this off season, his shooting numbers have remained very poor. Though Smart may be a big part of Boston’s tough defense, his below-average shooting often leads to empty possessions for the Boston offense, thus limiting his overall impact. To thrust himself back into this conversation, Smart must find more consistency on offense. Whether that means limiting himself to better three-point attempts or simply taking less and getting himself into the painted area more often, he has to find a better way to maximize his value on the court. After a whirlwind of offseason moves from the Celtics’ front office, Jaylen’s role has changed dramatically compared to his rookie season. Defensively, Brown has assumed the role of checking the opponent’s larger guard and wing threats most nights. At 6’7, Brown is showing this season that he’s able to guard a number of different player types in the league. So far we’ve seen Brown guard anyone from JJ Redick and Devin Booker to LeBron James and Giannis Antetokounmpo. Even more impressive are the major improvements showing up in Brown’s offensive game this season. Jaylen’s explosive athleticism gives him an edge over most defenders in transition and when attacking the basket within the half court offense. The biggest improvement, though? After shooting 34 percent on only 1.7 three-point attempts per game last season while playing limited minutes, Jaylen is up to 39.5 percent on 4.4 attempts per game in his first season as a starter. Specifically, Jaylen has looked very comfortable hoisting three-point shots from the corner, where he hits at over 42 percent. Brown has his weaknesses, though. He needs to tighten up his ball handling, especially when he’s driving towards the basket, and he has to become a more consistent free-throw shooter. No matter how glaring these two issues may be on offense for Brown, he has had a very impressive start to his second season. Jaylen looks to be developing into a deadly modern two-way NBA wing. Because of his versatility, Brown just might be Boston’s third best player. As I’ve mentioned in a previous post, the Celtics have a future star in Jayson. At only 19 years of age, Tatum is the only Celtic to start every game thus far. As wild as it may sound, Tatum looks to be even better than what he was advertised as during pre-draft evaluations. Remember those massive question marks surrounding Jayson’s three-point shooting ability? I’d imagine most draft experts would love to get a do-over on their Tatum projections. In the last ten games, the rookie is third on the team in scoring at 13.1 points per game, shooting 51.8 percent from the field overall, 52.6 percent from deep and 76.7 percent from the stripe. Tatum’s three-point shooting isn’t the only area of his game that has come as a surprise - he is second in total rebounding with 165 on the year to date. Not only is Tatum proving to be a three-point marksman, he’s also doing his part and then some in Boston’s team-rebounding scheme. Let’s also not forget that Tatum is fearless in the clutch, at least according to Kyrie. As is the case with any rookie, there is always room for improvement. Despite his length and athleticism, we’ve seen Tatum struggle to stay in front of his man on defense in one-on-one situations. On offense, Tatum needs to find it in him to be more aggressive. There is no reason why Tatum is sixth on the roster in field goal attempts per game at 9.1. What a great problem to have with a rookie! So … who is Boston’s third best player? As of today, December 13, 2017, Boston’s third best player is Jaylen Brown. That’s not to say I will feel the same way in a month or even a week, but right now I have to give Jaylen the slight edge over Jayson Tatum. The improvements we’ve seen in Brown’s offensive game make him a more complete and balanced two-way player. He’s taking the second-most shots on the team and shooting 46.3 percent from the field overall while routinely guarding the primary offensive threat for the opposing team. Tatum seems ready to overtake Jaylen as the Celtics’ second leading scorer, however, and he is only getting better each game. Unless Brown irons out some of the offensive inconsistencies in his game, it may not be long until Tatum’s steady scoring and rebounding outweigh Brown’s two-way impact.